Money in the Garage: Go fish! Spring weather is moving in and it's time for fishing season! Around these parts, trout season starts around the first week of April. An annual spring ritual, it' s a time when eager fishermen prepare to hit the creeks and rivers looking to catch a few rainbow trout. As a sometimes fisherman myself, I can tell you half the fun of fishing is the preparation. I like to bust out my fishing gear, clean out the tackle box, untangle the lines and set up new hooks and rigs. It's all part of the fun! There's an excitement in the air as the season approaches. It's like a fever that won't break until you make that first cast into the creek! You can take advantage of this "fever" by selling fishing gear. I've had pretty good luck selling fishing related stuff over the years. When I am at the garage sales, I always look for tackle boxes with plenty of lures and rigs inside. One of the hottest items to sell on eBay, eBid or Craigslist is tackle boxes. (Check out my blog piece from about a year ago) Because old tackle boxes are usually chock full of gear, they're often the first thing to get snapped up by buyers at a yard sale. Many contain lures that can be sold off individually or in small groups for big cash dollars. The older and more intricate the lures are, the higher the value. If you see an old tackle box and want to invest the time and money, you can do very well with them. But you may find tackle boxes and gear are a little too much to deal with. If so, there's something a little less complicated to sell-fishing vests and shirts. They're a "must-have" for many fishermen. 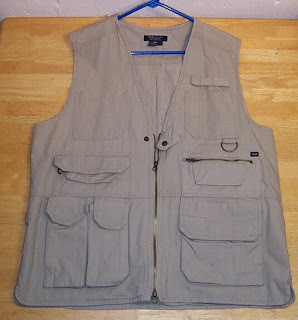 The serious trout or fly fishermen needs the handy fishing vest when standing in the middle of the creek. When it's time to fix a line or bait a hook, who wants to trudge back to a tackle box to retrieve gear? The properly stocked fishing vest stows all needed lures, rigs and baits within easy reach! Fishing vests and shirts can usually be found mixed in with the Men's shirts at your local Goodwill Store. While you won't find them every time you visit Goodwill, they do show up consistently in the racks. Take a look at this fishing vest that I found at my local Goodwill store. It was brand new and only cost me $4 dollars! I can't remember the name brand, but I am not sure it mattered. When buyers have the "fever" they like to bid no matter what! The fever was burning hot for this vest. It sold for a $45 dollars....a pretty good catch for only four bucks! What kind of "hot" spring season items do you sell? Share the fever with us!